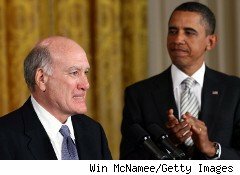 Can William Daley Boost Obama's Business Reputation? When President Barack Obama named William Daley the White House chief of staff, the business community cheered. The implication, at least, was that business leaders had perceived Obama as anti-business. "I think there was a pretty widely held belief among top-level business leaders that they were having trouble getting their voices heard in the White House," says Matt Bennett, a former Clinton administration official who co-founded a liberal think tank called the Third Way, which counts Daley as a board member. "They felt like it was difficult for them to get traction with the White House, and they felt like some of the things they were hearing from the White House were not helpful. There has been a level of difficulty in that relationship, and the White House is moving aggressively to fix that." Businesspeople "Can Talk to Him"
The opening salvo in the campaign to make nice with business came on Dec. 14, when Obama met with a group of chief executives and assured them he would back the private sector's efforts to get the economy moving. The appointment of Daley, former President Bill Clinton's secretary of commerce and a Wall Street banker with experience in several different industries -- as well as famous family Democratic party connections in Chicago -- is the second major initiative aimed at shoring up business support. "Clearly, bringing in somebody who is coming directly from the private sector is helpful," Bennett says. "Serving the Clinton administration and having a political philosophy that is more moderate gives the business community some sense that they can talk to him. And what they hear from him will help give them the certainty they need to make investments." Daley has extensive business credentials: Among many other positions, the senior executive at JPMorgan Chase (JPM) previously served on the board of aircraft maker Boeing (BA) and worked for drugmaker Abbott Laboratories (ABT). All three firms have a strong government interests. Chase is involved in scores of regulatory issues as one of the nation's largest lenders and dealer in financial instruments like derivatives. Boeing has many defense contracts. And Abbott is obviously directly affected by health care reform and Medicare prescription drug coverage. As the gatekeeper in the White House, Daley will have tremendous influence on those industries, even if he's not directly involved in day-to-day policymaking. Some liberal allies of Obama have complained that Daley's appointment is a conflict of interest. But not the business community. "Bill Daley is a man of stature and extraordinary experience in government, business, trade negotiations and global affairs," Thomas J. Donohue, president of the U.S. Chamber of Commerce, said in a statement. "We look forward to working with him to accelerate our recovery, grow the economy, create jobs and tackle America's global challenges." While the Daley appointment is being widely portrayed as a move to the center, the Obama administration has long denied that it's anti-business, pointing to its plans to give businesses accelerated expense deductions, its agreement to extend the Bush tax cuts for high-income taxpayers and its successful conclusion of a trade deal with South Korea. But groups like the Chamber of Commerce have lambasted the president for his health care policies, which it says have destroyed thousands of jobs. An effort to repeal the health care bill -- which Daley reportedly opposed -- is set to begin in the House next week, but it has little chance of success in a Senate still controlled by Democrats. While serving as Clinton's secretary of commerce, Daley helped guide the North American Free Trade Agreement through the Senate, where it finally won passage despite opposition from labor unions. NAFTA has become one of the angry symbols of opposition raised by the Tea Party wing of the Republican party, although corporate interests in the GOP clearly supported it. "I'm opposed to NAFTA," says Judson Wheeler Phillips, a Tennessee lawyer and founder of the Tea Party Nation, one of the opposition groups. "Obama didn't move to the center and name Daley the White House chief of staff to appease people like me."